The phylum cnidaria (silent c - pronounced /nai'deriə/) is also know as coelenterates. 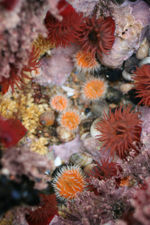 They are invertebrate animals that include the anemone, hydra, jellyfish, and coral. They are perhaps best known for being equipped with microscopic stinging cells called nematocysts. This page was last modified on 26 March 2007, at 22:28.